Known as the “hub” of Morris County, Denville is a small community with approximately 17,000 residents with a wonderful downtown area that is just a short stroll away from Saint Francis. Denville offers excellent restaurants featuring a wide selection of cuisine including American, Italian, Chinese, Seafood, Mexican, Thai and more to suit your tastes and budget. Be sure to check out Dine Out Denville, a popular annual event each fall, that features discounts and other special promotions at over 20 area restaurants. Two top destinations: Beignets: a unique fresh donut shop is one of the best donut places in New Jersey and The Pasta Shop: a restaurant that specializes in homemade pasta. If you love to shop, Denville offers a great selection of both national retailers and local family-owned stores. Clothing stores downtown include Namu, Sisters, Wish and many others. You will find Talbots, Chico’s, GAP and Jos. A. Banks a short car ride away. Gift shops in town include Faith & Begorra and Surprises in Store. There are also long-time anchor stores: Denville Hardware, Sweet Expressions, Shoe and Sneaker Barn, United Card and Smoke Shop, Urban Muse (Spa), Broadway Floral, Rita Rosa Bridal and Clyde’s Cleaners. Unique food shops include Dash of Thyme, a gourmet specialty boutique, and Grassroots Natural Market, featuring organic produce and wide variety of healthy grocery and health & beauty products. You’ll also want to check out Denville’s Farmer’s Market, open every Sunday June through November for local produce, baked goods and much more. When it comes to transportation, Denville is central to all major highways and public transportation. Access to New York City, Morristown, Newark, Secaucus and Hoboken is available on two New Jersey Transit train lines. Direct train service to Newark, Secaucus and Hoboken is also available. Lakeland Bus Line connects Denville directly with New York Port Authority. If you love games, you will have a lot to choose from, such as trivia, pool table, word game competitions, puzzles, Wii computer games, card and table games, shuffle board, bingo and bocci. 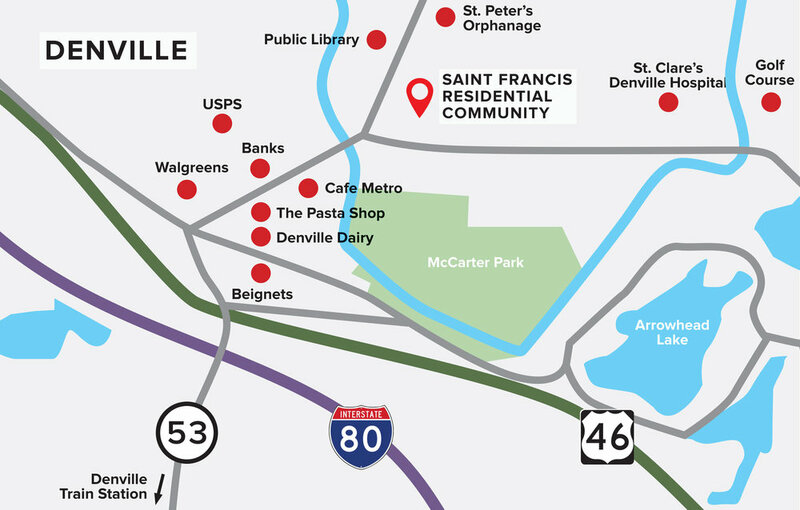 Many residents also make healthy walks a part of their daily routine, either on the tree-shaded Saint Francis grounds or in the safe and scenic surrounding town of Denville.